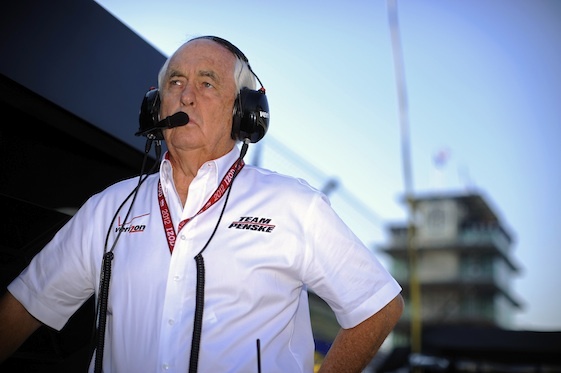 Roger Penske could fill a significant hole in his resume on Sunday. Roger Penske doesn’t need anything. Not in life, not in racing. But there are still some things he wants and one of those wants could be satisfied this weekend at Indianapolis Motor Speedway. Penske, for all his success in business, in racing in general and at Indy’s legendary 2.5-mile oval specifically, has not had one of his drivers win the Brickyard 400 Sprint Cup race. Having spent a bit of time around Penske, the guess here is that he would greet mention of that fact with a response delivered analytically deadpan. Especially if a camera were around. But those who have spent more than just a bit of time around him know how much adding a Brickyard victory would mean to The Captain. This race, they will tell you, is at Indianapolis Motor Speedway and that should let you know exactly how important it is to him. Penske has won 16 times as an Indy car owner. He’s won some of the most memorable, most important Indy 500s. He’s won with Mears, a couple of Unsers, Danny Sullivan and perhaps Penske’s all-time favorite driver, Mark Donohue. He’s won at Indy in the ’70s and he won here last May with Juan Pablo Montoya. Those around Penske, now 78 years old, wants a Brickyard victory very badly if very privately. Penske, despite the businessman’s-coolness when red camera lights are on, does get excited when important things happen in his life. That came through the day after Ryan Newman gave him his first Daytona 500 victory in 2008. At the champion’s breakfast, Penske was pulled aside by a couple beat writers and with a bit of prodding finally got quite effusive and emotional as he talked about what it meant to him. A check of the faces of those beat writers as Penske talked showed that The Captain’s emotion was contagious. And the contagion extends well past the hardened journalists. It’s very telling about Penske and his place in racing lore to hear his drivers speak about what it means to them to win big races for their owner. “It would be very special to give him a Brickyard 400,” Logano, said, “along with the Indy 500 he won earlier this year up here and the Daytona 500 we won earlier, too. So this could be quite the trifecta if we could make it happen. Logano said that if one of Team Penske’s drivers is not celebrating in historic Victory Circle at Indy late Sunday afternoon, it certainly won’t be because somebody on the team failed to become properly motivated for the Brickyard 400.